Place the rice in a microwave-safe bowl, cover with at least two inches of water, and zap in the microwave for 7 minutes. Add the remaining ingredients to the same bowl and add more water if needed to cover the grains and legumes by at least 2 inches. Set it all aside to soak for three hours. Drain the legumes and grains and place in a blender with just enough water to keep the blades moving. Blend into a smooth paste. Your dosa batter should have the consistency of a pancake batter minus the lumps. Add salt and mix in thoroughly. Remove to a bowl. To make the dosas, heat a griddle until water throw on the surface sizzles and evaporates. Using a ladle with a rounded bottom, place about 1/4 cup of the dosa batter in the center of the griddle. Using the bottom of the ladle, start spreading the batter into a round, moving outward from the center in a spiraling motion. 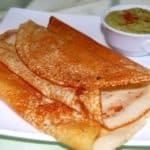 Your dosa should be rather thin and crepe-like. Sprinkle a few drops of oil around the edges of the crepe. This helps the edge brown and become all crispy, and it also helps release the crepe. Let the bottom cook until golden-brown. If your crepe is thin enough, you don’t really need to cook the other side, but if it is thick, flip it over and cook another minute. Serve hot and refrigerate any remaining dosa batter. Place all the ingredients in a blender and blend into a smooth paste, adding water if necessary. Remove to a bowl and serve sprinkled with some paprika. *Nutrition values are for the crepes only.